2005. 2.5" x 4.25" letterpress mini chapbook; paper wrappers with printed covers and hand sewn binding. Written in Oregon in the mid 1950s. This previously unpublished manuscript is a rare glimpse into the mind of Brautigan as a young man hopelessly in love with a girl named Linda. 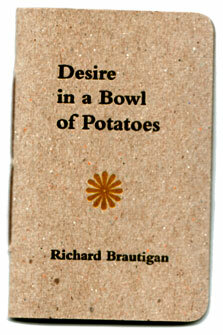 Contains fourteen poems. Limited edition of 250 numbered copies and 26 lettered hardbound copies. Kind permission to publish from copyright owners James Musser & Burton Weiss.